Zion-Mt. Carmel Hwy - Highway 9 runs through the main section of Zion. There are many hikes and view points along this fifteen mile road. The Zion-Mt. Carmel Hwy is open year-round and begins at the south entrance of the park, continues through the park's east entrance and ends 12 miles outside the park at its terminus in Mt. Carmel Junction. This section of the park is usually accessed only by the Zion Canyon Shuttle. When the shuttle shuts down for the season from October until April then private vehicles are allowed to travel this 6 mile spur off the Zion-Mt. Carmel Hwy called the Zion Canyon Scenic Drive. Kolob - This section is the remote backcountry section of the park is accessed off Hwy 9 in the small town of Virgin. 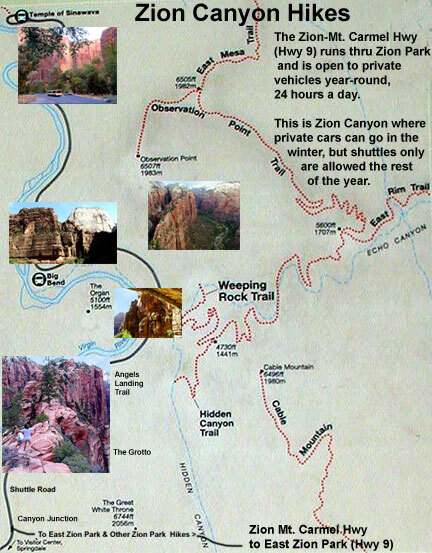 Zion Canyon is accessed via a 6 mile road called the Zion Canyon Scenic Drive. It is but one small section of the park. From April to October it is traveled only by taking the free Zion Canyon Shuttle. The Zion-Mt. Carmel Highway (SR 9) runs from the south entrance of the park, through the parks east entrance to its terminus in Mt. Carmel Junction, 12 miles past the east entrance to the park. This road is open 24 hours a day, 7 days a week. From April until October the only access to the Scenic Drive is via shuttle. From October until April private vehicles can travel the Scenic Drive. SR 9 and SR 89 meet in Mt. Carmel Junction where access to Bryce Canyon National Park and the North Rim of the Grand Canyon are just a short distance away. If you are visiting all the spectacular wonders of Southern Utah, stay at the east side of the park.